Certificate Authorities for HTTPS, PGP authentication and multi-signature cryptographic notarizing can now be done on top of Bitcoin, thanks to Signatura. Developed out of the Buenos Aires Bitcoin Center in Argentina, Signatura.co a digital notary and authentication service on top of Bitcoin, just ended its public beta and opened to the public. Signatura allows users to sign and authenticate just about any document using the Bitcoin blockchain. It brings Bitcoin’s high security and decentralization to important institutions like notaries and internet certificate authorities. It’s not hyperbole so say these institutions are vital to modern civilization. Notaries are a kind of semi-centralized set of databases in liberal democracies today. Importantly, they keep tabs on who owns what (or try to, anyway). Without notaries, “property rights” — a key tenet in both free market-oriented societies and classical liberalism — would not be possible. For property rights to be respected, there must be some way of proving who owns what and making sure there is no fraud or double spending. This includes verifying a user’s identity in a viable legal manner, one of Signatura’s focuses. The internet shares a similar infrastructure, with its certificate authorities (CAs). These are organizations that streamline the credibility of other sites. Like a stamp of approval, organizations like Verisign put their name on the line to verify that your website’s HTTPS encrypted tunnel actually is routing to your server. That is their job, anyway. 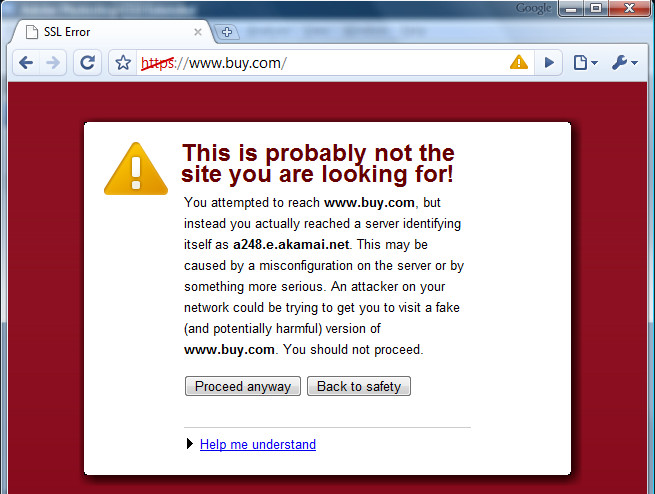 Your browser, in turn, looks at these certificates and decides whether to show you a green lock or a red warning. This is essential to user experience. CAs attempt to do for secure communications what Bitcoin does for money. That is, provide a secure record of who owns what, so cheating becomes very difficult. If a CA fails, man-in-the-middle attacks become possible. It’s likely websites with critical information flowing through them, like banks, would suffer from impersonators. Some of these CAs are so big, centralized and vulnerable to government and corporate pressure that they even occasionally comply with man-in-the-middle attacks. Bitcoin’s decentralization, immutability, and massive hashrate make it an obvious candidate for managing these services. The team at Signatura understands this. And they are not the only ones. Blockstack, Factom, Emercoin and Ubiquity are also organizations developing Bitcoin or blockchain-based notarization and authentication. Signatura’s focus seems to be towards individual and institutional authentication, particularly for individuals in critical and official government roles. Like traditional digital signature authorities and CAs, Signatura has its own public key that it uses to sign documents its users want to authenticate. While this signature provides some credibility, at the end of the day it’s not the only thing that matters. 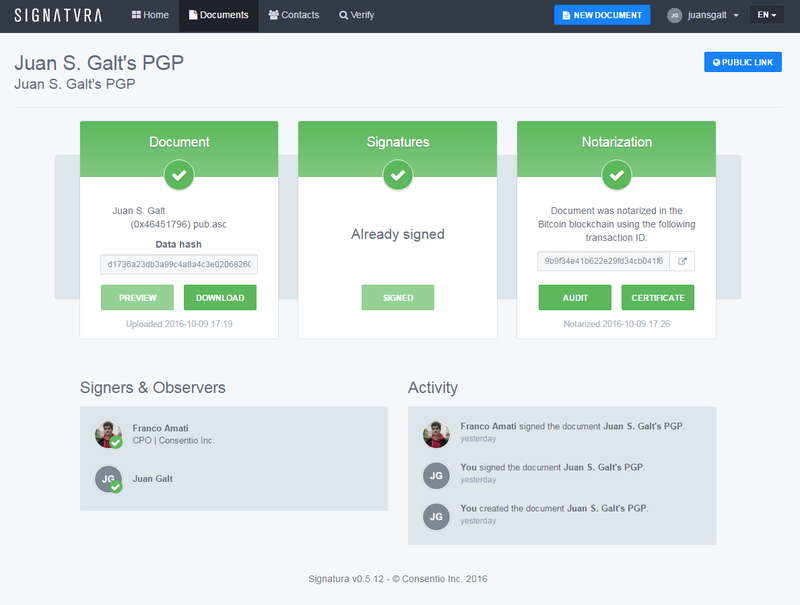 Users can choose who co-signs their documents. This can be anyone they trust or is reputable, be it their lawyer, their business partner… Or their mom. Anyone can create an account at Signatura.co and become cosigners. User identity verification happens with private/public key cryptography similar to Bitcoin’s, as well as through connections with a user’s social media — like Facebook, Twitter and Linkedin. In this sense, Signatura is quite similar to Onename.com, one of the first to offer a blockchain authentication service. Following the security model Blockchain.info pioneered, Signatura provides users a master seed and encrypts it with a password. If users forget the password they can restore from the seed. If they lose both, however, they will permanently lose access. Signatura is currently developing an API, to serve institutional and larger organizations and not just small businesses and other independent users. New users will receive a positive balance of 10 credits. These are to access Signatura resources and sign transactions on the Bitcoin blockchain. Users can purchase further credits to access more services later on. However, users cannot exchange credits with each other, and so credits do not trade on the open market. What do you think of Signatura and blockchain notary services? Will this take off in the future? Let us know in the comments.